Here are just a few photos from this years Nozomi Young Koi Show. With over 140 koi entered into the show this year the Nozomi Young Koi Show is quickly becoming the largest koi show in the Northwest! Congratulations to all of the winners and a special thank you to Mr. Takahiro Omosako and Mr. Grant Fujita for traveling so far to help us make this event a huge success! Next years Nozomi Young Koi Show will be held on Saturday, June 13th. Mark your calendar early and be sure to attend in 2015! This entry was posted in Uncategorized on June 24, 2014 by koiadmin. 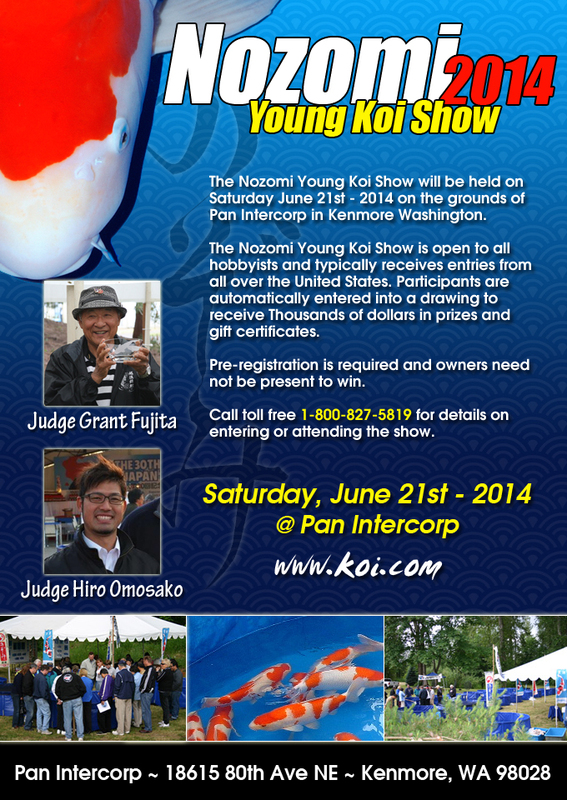 The 2014 Nozomi Young Koi Show will be held on Saturday, June 21st on the grounds of Pan Intercorp in Kenmore Washington. The Nozomi Young Koi Show is open to all hobbyists and typically receives entries from all over the United States. Participants are automatically entered into a drawing for a number of Prizes including a Tategoi from Omosako Koi Farm! Save the date to come enjoy the show and meet the judges in person! Call toll free 1-800-827-5819 for details on entering or attending the show. This entry was posted in Uncategorized on June 7, 2014 by koiadmin.